A first-ever DeKalb County Track and Field Championships boys’ title went to the Martin Luther King Jr. Lions as they held off Arabia Mountain during Monday’s track finals 88-73. Martin Luther King Jr. held a 24-point lead (51-27) over Arabia Mountain in the boys’ meet with Tucker (23.50) in third, Dunwoody (23.00) in fourth and defending champion Southwest DeKalb in fifth (21) after the first day of competition. The Lions picked up three gold medals on the first day led by Keion Cush’s sweep of the discus (140’-06.00”) and shot put (47’-02.00”). TaQuan McKenzie picked up the Lions’ third medal on Saturday with his win in the high jump (6”-02.00”). 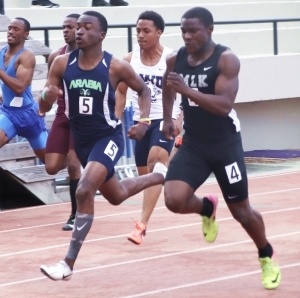 King’s Jhivon Wilson and Arabia Mountain’s Jordan Barrow put together a pair of exciting races in the 100- and 200-meter dashes as they traded firsts and seconds. Wilson (10.77) came out on top in the 100-meter dash by just 0.01 of a second over Barrow (10.78). Barrow (21.631) returned the favor in the 200 as he managed to nip Wilson (21.633) at the line by a mere 0.002 of a second. 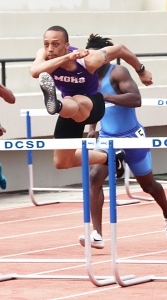 The two teams battled throughout the rest of the meet and held off charges by Miller Grove and defending champion Southwest DeKalb for the top two spots. Miller Grove made a big leap in the standings picking up four gold medals on the day including a sweep of the hurdle titles. Walik Robinson won the 110 hurdles in 14.48 with Darryl Burton III finishing second in 14.59. Burton claimed the 300 meter hurdle title with a time of 39.16. Chuck Shawn Collins picked up the 400-meter dash gold for Miller Grove with a time of 48.05 and the 4×400 meter relay team was first in 3:18.37. Clarkston’s Thaddee Barge won the 1600-meter run in 4:30.30 edging out Decatur’s Eoin McNally (4:30.35) and then came up just short to Lithonia’s Jalen Bristol (1:59.25) with a time of 1:59.31. 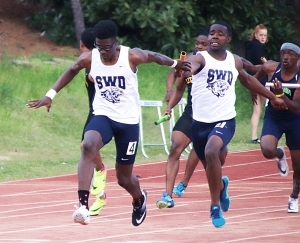 Southwest DeKalb (41.74) opened the day on Monday cruising to a win in the 4×100-meter relay over Miller Grove (42.09) for the gold. Arabia Mountain’s first day got a boost from Kerrell Hurt Jr.’s win in the triple jump (44’-07.00”). Other winners during action on the first day of competition included Carter Rathur of Druid Hills in the 3200m run (9:51.74), Tommy Wright of Southwest DeKalb in the long jump (23’-01.75”) and Dunwoody freshman Alon Rogow in the pole vault (13’-04.00”).